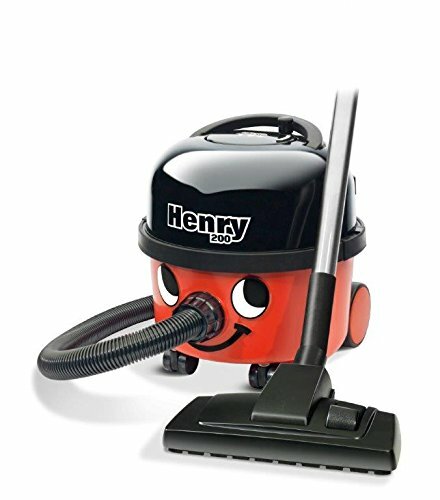 Whenever someone refers to a vacuum cleaner by the name ‘Henry’, most of us will instinctively visualise the little smiley face on the black and red machine. The Numatic HVR200-11 is one of the most popular machines around the home (with over 2,000 reviews on Amazon). This HVR200 (not to be mixed up with it’s commercial equivalent, the NVR200-11), is a perfect addition to the home. It’s THE strongest vacuum cleaner we’ve used. It is a little weighty for a lightweight model, at just over 8kg, but there are so many plus points! The power, for one, is well known and there is very little this machine won’t get rid of. Use it on hard floors or carpets and the results are amazing. The capacity of an enormous 9 litres means you will probably forget all about changing the bag, which happens to be a pretty easy process. – Uses Microflo dust bags (large and cheap). – Accessory kit with a number of handy implements. – 9 litre dust bags, cheap to replace. – Can’t store accessories on board. How does the Henry compare to other lightweight vacuum cleaners? ← Shark NV680UKT – excellent attachments and amazing suction!